Once upon a time a little lamb was found wandering on DaisyBank. "Where's my Mummy?" it thought. the lamb looked around for any clues as to where its mummy was. All the lamb could see was a pair of tights. The hunt was on!! Now the lamb had the scent, it followed its nose to find the trail its mummy had left. it wandered onto a road called Wood Drive where it was confronted by an insane knobhead. "Are you my mummy?" the insane knobhead replied "eh eh eh". The lamb journeyed on it met a strange half woman half cat creature in Dane Close "Are you my mummy?" 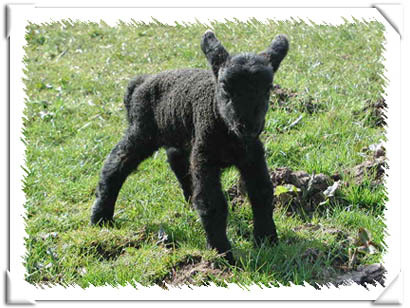 it replied "little boo boo" the lamb soldiered on through Weaver Close and met a Lepricorn "Are you my mummy?" it replied "Arnamounamanny". The lamb travelled on. It came to a place that seemed familiar... it knocked on a door. Number 47 Gowy Close. Vicky Pollard opened the door "Are you my mummy?" asked the lamb "yeah" said Vicky "Why did you abandon me?" cried the lamb "I didn't" said Vicky "I swapped you for a Westlife cd" "How could you " sobbed the lamb. "I know" said Vicky "they're rubb-ash!! Click the photo of Daisy to email your friends.